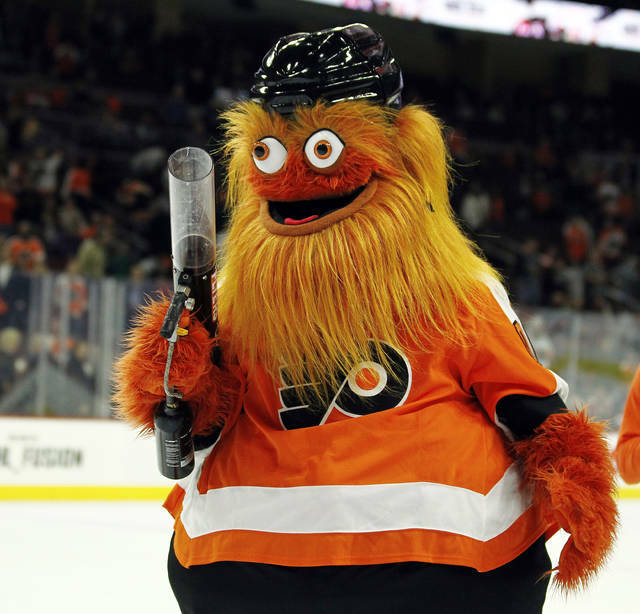 PHILADELPHIA (AP) — What better way to surprise a Philadelphia wedding party than with the instant sensation Gritty? KYW-TV reports newlyweds were shocked when the 7-foot (2-meter) mascot for the NHL’s Philadelphia Flyers showed up Friday night and started dancing with the bride. A video taken by a relative and posted to Twitter captures the orange monster hugging Heather Grossmuller and Karl Schwemlein during their reception. The video shows Gritty and Grossmuller getting down on the dance floor. Grossmuller’s father, Ray, orchestrated the surprise for his daughter who is a raving Flyers fan. Gritty has become a huge hit since becoming the team’s mascot in September. He has hung with celebrities and his face put on beer cans and tattoos. He was honored last month with a resolution by the city council.